Six Senses Laamu is on one of the southern-most atolls in The Maldives, a 50 minute flight from Malé and a short speed boat ride from the local airport. The peace and quiet of the island absolutely make the extra hop, skip and jump worthwhile. We stepped off the boat, were asked to take off our shoes and were handed home-made lemonade and pieces of fresh coconut to nibble on. We had arrived in a small corner of paradise. 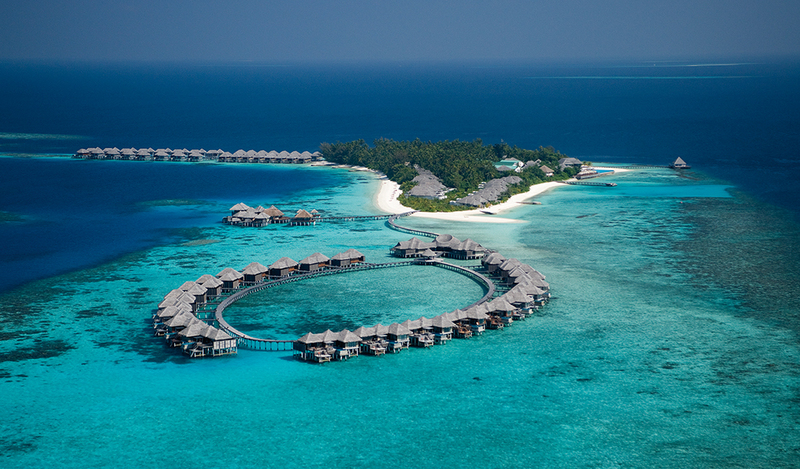 Olhuveli Island, home to Six Senses, has 96 villas which fan out from three jetties. Half the island and its attractions are over the water and the rest – including the spa – are on land. Pull up your bike (you’ll find two waiting for you at your villa) and explore. There are dive and water sports centres, a kids club, daily excursions and just off shore you’ll find Yin Yang – a break first surfed by legendary American surfer Pat O’Connell. It’s the finishing touches at Laamu that make it stand out. 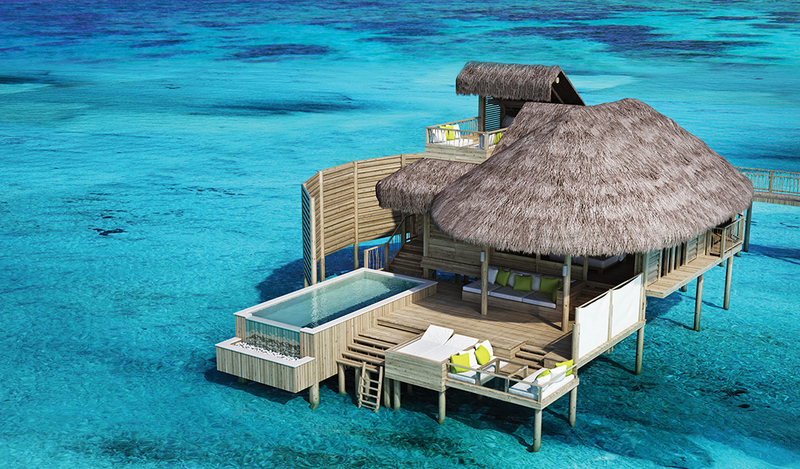 Six Senses is an eco-friendly company and focuses on the footprint the resort has on the ocean. Wherever possible they don’t use plastic; you’ll find hessian and linen instead. On arrival, we put our shoes in a cotton bag labelled ‘down to earth’. 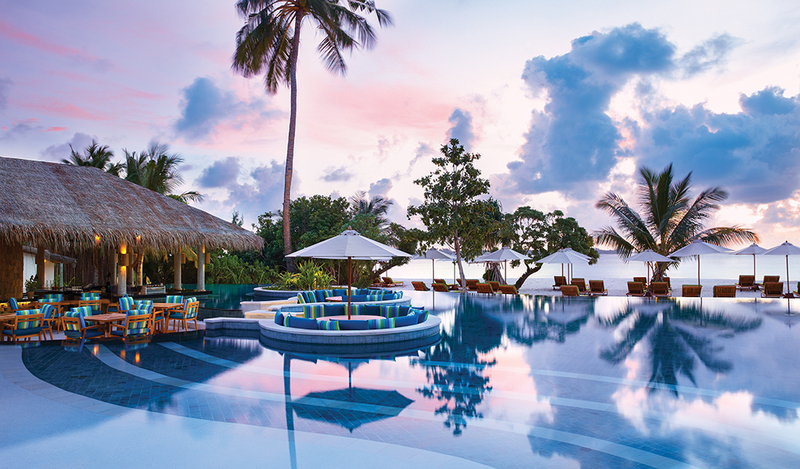 The traditional Maldivian resort – think honey-coloured wood, white linen and infinite ocean views – also uses bright, happy colours. We saw splashes of blues, greens and oranges to bring the colours found in nature, inside. Six Senses is all about barefoot luxury. All staff walk barefoot around the island and you are encouraged to do the same. 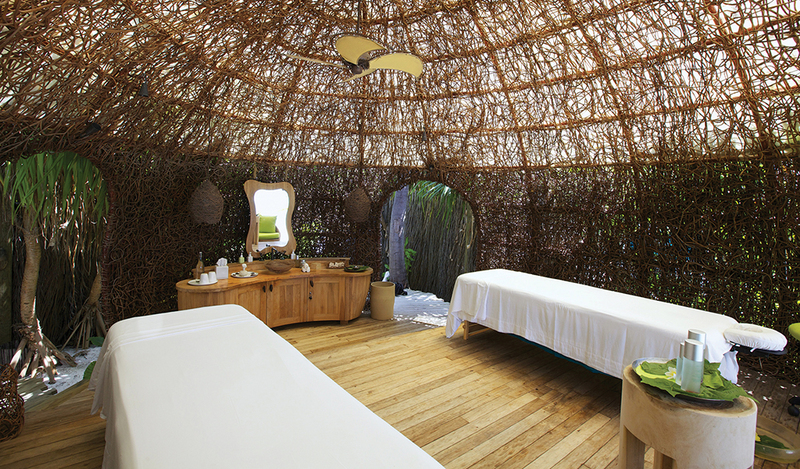 The spa is a few minutes walk from the reception, but very discreetly placed behind the island's natural vegetation. As you step out of the trees, you’ll be greeted by the calming scent of burning incense. There are nine treatment ‘nests’ scattered around the spa area, including two for couples. Ours quite literally looked like a nest, a semi-circular structure built of branches entwined around each other. Post treatment you can take a seat in the neighbouring juice bar which has an undisturbed view of the beach. Choose a water, ginger tea or a juice from the menu, all served with almonds and dried coconut. I choose the Green Machine with apple and spirulina – fresh and delicious. The whole spa is a hideaway, so discreet you would hardly know it was there, yet the views allow you to see out to the world beyond. You’ll find steam rooms in the private changing rooms and the gym and studio above spa reception, where daily fitness classes take place. We started our spa journey with a 15-minute Ayurvedic consultation, where one of the resident experts sat with us to determine our ‘dosha type’ and in turn select the right treatments for us. Ayurveda is an ancient Indian philosophy of life that the treatments embrace. Your ‘dosha type’ will be a combination of fire, water, earth, ether and air, all of which you need to keep in balance. Couples have their consultation in the same room, one after the other where physical and emotional characteristics are spoken about openly. In our couples treatment nest, I had an Oriental Massage (60 minutes, $175) and my spa partner had a Holistic Massage (60 minutes, $160). The nest was open at the sides so we happily relaxed to the sound of the birds singing and trees gently moving in the breeze. My massage included lots of stretching, joint rotations and pressure point work. I enjoyed the deep pressure, which apparently my water element needed. The Holistic Massage was much softer with a gentle touch, ideal for those looking to switch off, relax and balance their fire. At the end of the treatment we were gently brought back to earth by a Tibetan singing bowl. The bowl makes a noise as a baton is swirled around the centre and is believed to send positive vibrations into the air. Laamu has five restaurants, two on land and three are over the water. We ate in the Chill Bar looking out at the ocean: the Vietnamese menu has lots of fresh fish in warm and rich spices. The Leaf restaurant stands on stilts at the centre of the island. Local food is cooked in the centre of the restaurant in an open kitchen – save time and space for the four course meal with wine pairing. It was unforgettable. With three other restaurants to try you won’t run out of options; Zen serves modern Japanese food, Longitude has a good mix of international flavours, Sip Sip offers poolside dining. Don’t miss the ice cream studio. It has 42 flavours including a selection of sorbets and a sugar-free option. They are all organic and made on the island. Your inner child will love it. • Honeymooners and romance seekers will love the sheer peace and quiet of Laamu. The island puts a new meaning to the word ‘remote’, making it a great place to reconnect with one another. • Waterbabies will enjoy being able to eat three meals a day with views over the water. We never tired of looking out over the ocean. 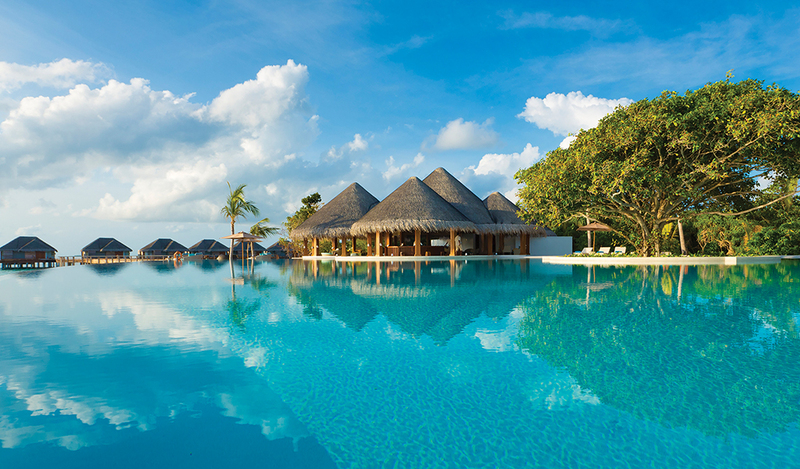 • The Laamu Water Villas – ours took our breath away. The room was filled with beautifully quirky touches and the bed, which was at the centre of the room, had undisturbed, panoramic views of the ocean. • The Ayurvedic treatments. Very few UK spas offer proper Ayuvedic treatments, so if you have not tried one before, do. They have the elements of relaxation we tend to crave at a spa, but with some thoughtful flourishes.